One of my absolute favorite summertime drinks is aab talebi (iced melon). It is one of Mr. Dad's specialties! 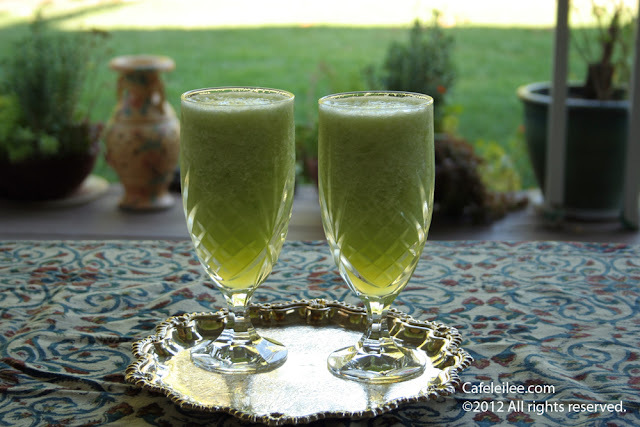 I remember in the hot and humid summer days of Mazandaran (northern province of Iran) nothing would cool our bodies and souls like a large glass of aab talebi. As a teenager I used to be able to chug down 3 large glasses full of aab talebi in one sitting! Now, I don't think I can do that without ending up in the hospital's emergency room. Cut the melon in half, and remove the seeds using a spoon. 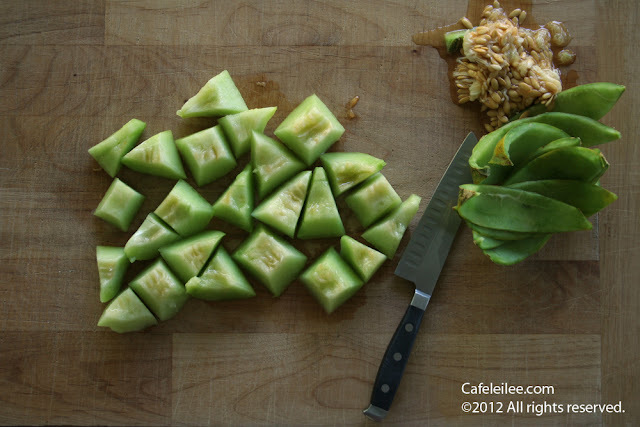 Remove the skin and cut the melon in cubes. 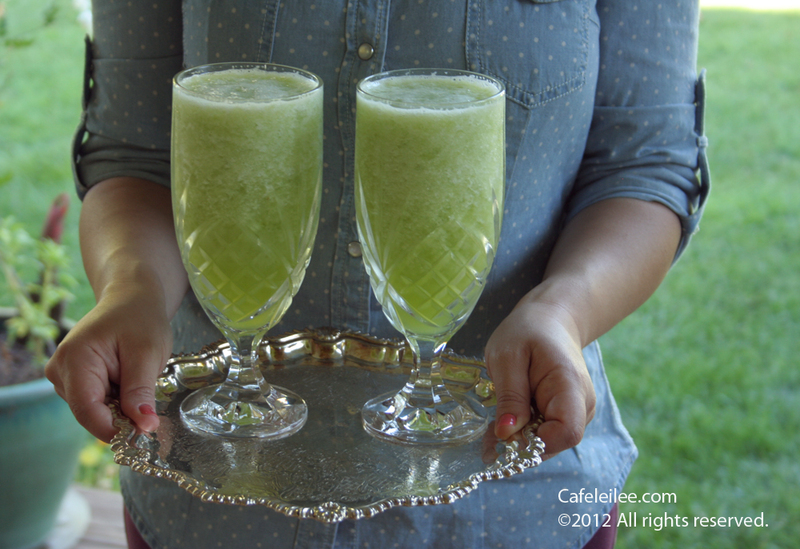 In a blender, put the cut up melons with the ice cubes, sugar and rosewater. Blend until the ice has crushed. Adjust the sweetness to your liking and serve. محبوبترین نوشیدنی تابستونی اینجانب آب طالبی هست که آقای پدر استاد درست کردنش هست. توی تابستونهای داغ و شرجی مازندران هیچ چیزی مثل یک آب طالبی تگرگی روح و جون آدم رو خنک نمیکنه. دوره نوجوانی میتونستم ٣ تا لیوان بزرگ آب طالبی رو در یک نشست سر بکشم. که الان اگر بخوام این کار رو بکنم شانس اوردم اگر پام به اورژانس کشیده نشه! طالبی را نصف کنید و با قاشق تخم ها را جدا کنید. پوست طالبی را بگیرید و طالبی را خورد کنید. طالبی را با یخ، شکر و گلاب توی مخلوط کن بریزید و مخلوط کنید تا یخ خورد شود. شیرینی آب طالبی را به اندازه دلخواه میزان کنید و سرو کنید. FABulous! Rooheh adam shat misheh by just looking at it!